Tourist Information kiosks are not as ubiquitous in the United States as they are in Europe, but Visitor Information Centers do exist in Los Angeles if you know where to look for them. Their friendly multi-lingual staff can help you book hotels, tours, shows and attractions tickets or make dinner reservations. They can provide you with walking maps of the area around them and attraction brochures. They also often have discount shopping coupons available for nearby retailers. Unlike the better-staffed Visitor Centers, kiosks generally only provide maps, brochures, and directions and may not sell attraction and tour tickets. In addition to these Visitor Centers, the information desk staff at shopping malls, and your hotel concierges can provide many of the same services. However, unlike your hotel concierge, the Visitor Information staff are not expecting a tip for selling you attraction tickets and making you reservations. Location: On the 2nd Floor of the Hollywood & Highland shopping complex at 6801 Hollywood Blvd, #207, Hollywood, CA 90028 (moved inside from the previous location out front). It's now deep inside, to the left of the Dolby Theatre, next to the Starline Tours office. Parking: available for a nominal fee in the Hollywood and Highland parking structure or in metered spaces along the street. Tip: If you're parking at Hollywood & Highland Center to explore Hollywood, the Visitor Information Center can validate your parking so you only pay $2 for the first 2 hours. 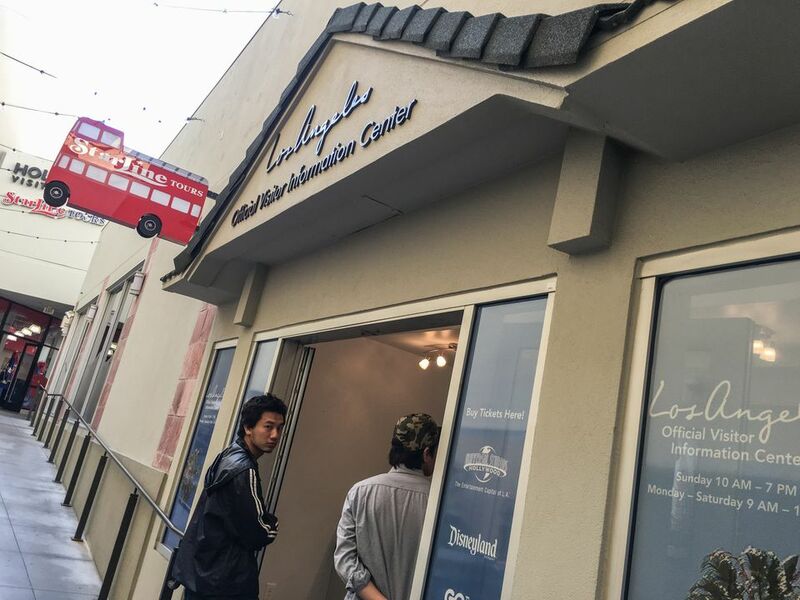 Note: This Visitor Information Center has relocated 3 times within Hollywood & Highland, so if you don't find it at #207, check the directory for its new location. If you just need a quick map, there's a Visitor Information kiosk in the Babylon Courtyard at Hollywood & Highland Center. They do sell some attraction tickets, but only accept credit cards. However they don't validate parking, so for that you'll have to find suite 207 inside. Location: Palisades Park at 1400 Ocean Avenue, Santa Monica, CA 90401. Location: In the middle of the 1300 block of the Third Street Promenade in Santa Monica between Santa Monica Blvd. Location: 301 E. Ocean Blvd, Suite 1900, Inside the Long Beach World Trade Center at World Trade Center and Ocean. Located at the end of the Metro Blue Line at the bus transit center, this Visitor Center is a street-front window, but it has a public restroom, which comes in handy if you just took the train from LA. Hours: Mon-Sun 11:30 am - 4:30 pm, restrooms open daily 5 am to 1:30 am. Located near the Aquarium of the Pacific at Rainbow Harbor. Location: 640 W. Katella Ave. This information was accurate at the time of publication but may change at any time. If you are going out of your way to visit one of these visitor centers, please call to confirm their location and open hours.